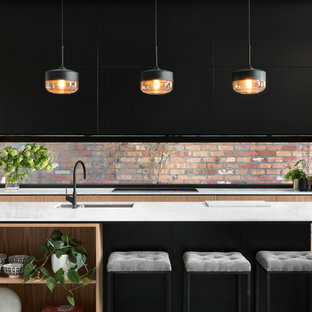 Inspiration for a contemporary kitchen in Melbourne with a double-bowl sink, flat-panel cabinets, light wood cabinets and an island. 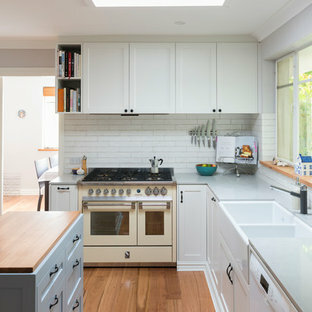 Inspiration for a transitional l-shaped separate kitchen in Canberra - Queanbeyan with a farmhouse sink, shaker cabinets, white cabinets, white splashback, brick splashback, white appliances, medium hardwood floors, an island, brown floor and grey benchtop. 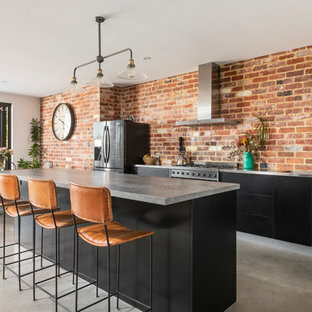 Photo of a mid-sized industrial galley eat-in kitchen in Perth with concrete floors, an integrated sink, flat-panel cabinets, black cabinets, concrete benchtops, red splashback, brick splashback, stainless steel appliances, an island, grey floor and grey benchtop. 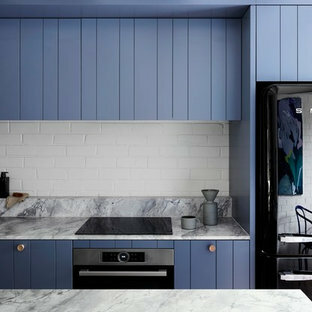 Design ideas for a small contemporary galley open plan kitchen in Melbourne with an undermount sink, blue cabinets, quartzite benchtops, white splashback, brick splashback, black appliances, medium hardwood floors, an island, grey floor, flat-panel cabinets and grey benchtop. This is an example of a contemporary galley eat-in kitchen in Surrey with marble benchtops, red splashback, stainless steel appliances, medium hardwood floors, an island and white cabinets. 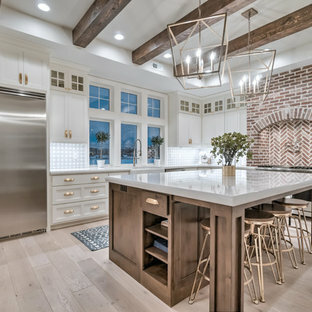 Design ideas for a country l-shaped kitchen in Other with a farmhouse sink, raised-panel cabinets, white cabinets, grey splashback, brick splashback, stainless steel appliances, light hardwood floors, an island, beige floor and white benchtop. Design ideas for a transitional galley kitchen in Houston with a farmhouse sink, recessed-panel cabinets, white cabinets and panelled appliances. 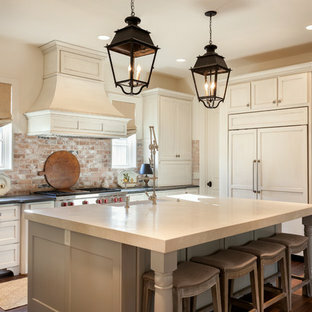 Photo of a large traditional u-shaped eat-in kitchen in Houston with a farmhouse sink, shaker cabinets, white cabinets, panelled appliances, dark hardwood floors, an island, soapstone benchtops and brick splashback. Country u-shaped kitchen in Birmingham with shaker cabinets, white cabinets, red splashback, brick splashback, black appliances, dark hardwood floors, an island and brown floor. Design ideas for a small eclectic l-shaped separate kitchen in Tel Aviv with an island, flat-panel cabinets, yellow cabinets, coloured appliances and painted wood floors. Large beach style l-shaped kitchen in Orange County with a farmhouse sink, shaker cabinets, white cabinets, marble benchtops, white splashback, stainless steel appliances, light hardwood floors and an island. 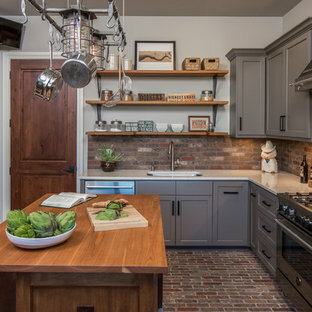 Inspiration for a mid-sized transitional l-shaped eat-in kitchen in Columbus with a farmhouse sink, shaker cabinets, grey cabinets, brick splashback, stainless steel appliances, dark hardwood floors, an island, wood benchtops, red splashback, brown floor and brown benchtop. Inspiration for a contemporary separate kitchen in Houston with stainless steel appliances, a farmhouse sink, flat-panel cabinets, medium wood cabinets and stainless steel benchtops. 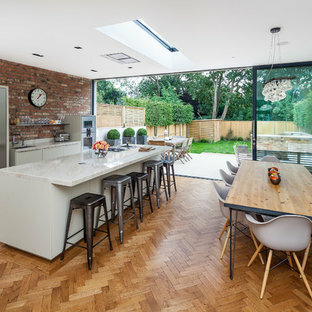 Photo of a transitional l-shaped eat-in kitchen in London with glass-front cabinets, green cabinets, wood benchtops, no island and a farmhouse sink. Mediterranean kitchen in San Francisco with black appliances. 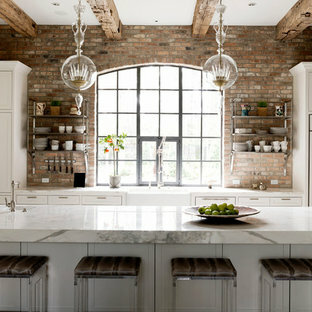 Photo of a large country l-shaped separate kitchen in Austin with an undermount sink, shaker cabinets, grey cabinets, stainless steel appliances, brick floors, an island and brick splashback. 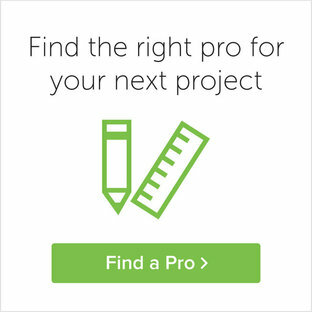 Inspiration for a large contemporary l-shaped open plan kitchen in Melbourne with flat-panel cabinets, white cabinets, marble benchtops, stainless steel appliances, medium hardwood floors, an island, brown splashback and brick splashback.